The What: Lightware USA has introduced the MMX4x2-HT200, an HDBaseT-compatible, single Cat-X-based mini matrix switcher designed for smaller collaborative places. The What Else: The MMX4x2-HT200 features three HDMI inputs and one HDBaseT-compatible TPS input port, plus two independent HDMI outputs. It is fully 4K/UHD/3D capable and HDCP compliant, and has zero frame delay. The system offers many common features from full-size Lightware matrix switchers. Proprietary Lightware technologies such as Pixel Accurate Reclocking and Advanced EDID Management are included. The switcher also has built-in Event Manager, a control feature configurable via free, downloadable Lightware Device Controller software. On the audio side, content can be de-embedded from the HDMI signal to a balanced five-pole Phoenix (Euroblock) port, and the external audio signal can be embedded into the HDMI stream from another five-pole Phoenix input port. The volume and gain properties of the audio signal can be modified at both input and output. The MMX4x2-HT200 has RS-232, IR, and Ethernet extension over TPS. The switcher also offers additional RS-232, Ethernet, and USB control options. 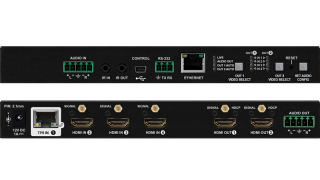 The Bottom Line: The new matrix switcher has a small footprint, making it well suited for classrooms, meeting and conference rooms, control rooms, and home cinemas. It handles laptop, PC, videoconferencing, and cloud sources and outputs to videoconferencing systems, monitors, and speakers. The new switcher will be shipping in late Spring 2017.